A new infographic shows that six key factors are driving the change we’re seeing right right now: extreme longevity, the rise of smart machines and systems, our computational world, new media ecology, superstructures organizations and the globally connected world. With these massive issues in play, what will the working landscape look like in five years? 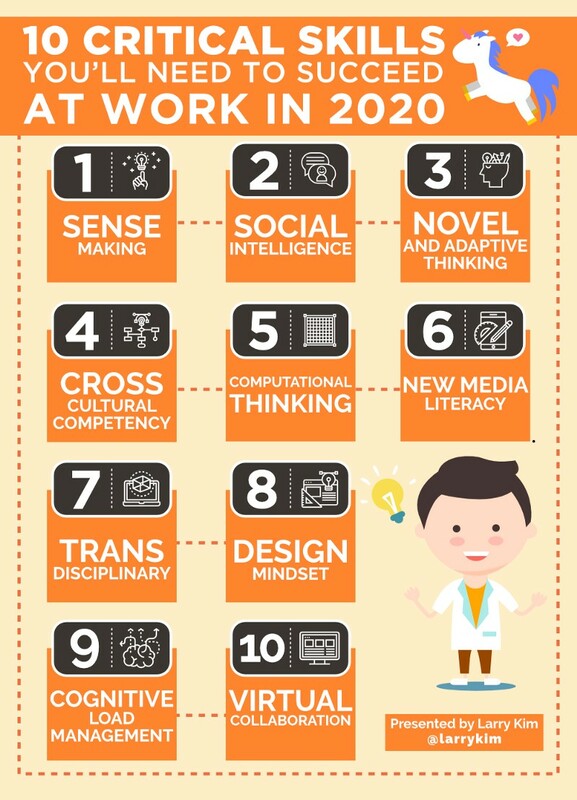 What skills will employees need to succeed? I’ll tell you one thing: they look nothing like the skills desired of workers in the industrial revolution, or even in the dot-com era. In 2020, the ability to come up with solutions, ideas and responses will be highly sought after and will propel you to the front of the business line. New media literacy — the ability to critically asses and develop content by utilizing and leveraging new forms of media effectively — will be highly desirable in employees. Cross cultural competency, the ability to operate within different cultural settings, will be needed to thrive in work and business as it becomes increasingly global. A design mindset is also going to be key. If you’re able to represent and develop tasks and work processes that create desired outcomes, you’ll be in demand. And if you can’t work well with others in virtual environments, well…telecommuting isn’t just a trendy thing some hippy employers are offering. Virtual collaboration, the ability to work productively while driving engagement and demonstrating presence as a member of a virtual team, is the way business will increasingly be done.